Nobody wants to make your period more complicated. It’s already an inconvenience at best, or a horrible monthly occurrence at worst. But when it comes to choosing the period products you use, there are a couple of things to consider. 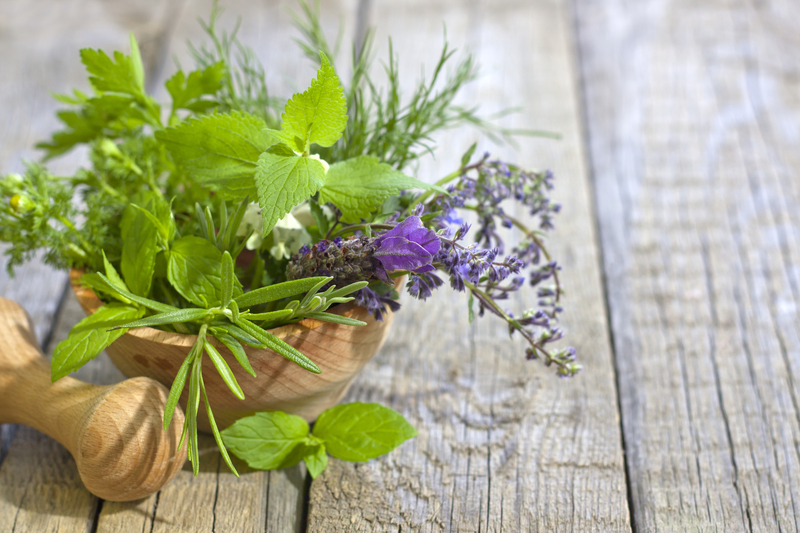 When asked why someone should consider a ‘green’ or natural period product, I always think of two things – your health and the environment. I’m not about fear mongering, but I am about giving you all the facts. Here’s a couple. There are sketchy ingredients in conventional period products. There are ingredients like aluminum, alcohols, fragrance, and dioxin that have been found in period products like pads and tampons (1). Dioxin is probably the most worrisome. It’s found in bleached tampons and it’s been linked to health concerns like cancer and endometriosis (1). While Health Canada hasn’t taken a stance on dioxin, European countries say it’s not acceptable and the World Health Organization considers it a carcinogen (1). You might have heard that these chemicals are found in very small quantities so there aren’t a lot of effects. But that’s not necessarily true. 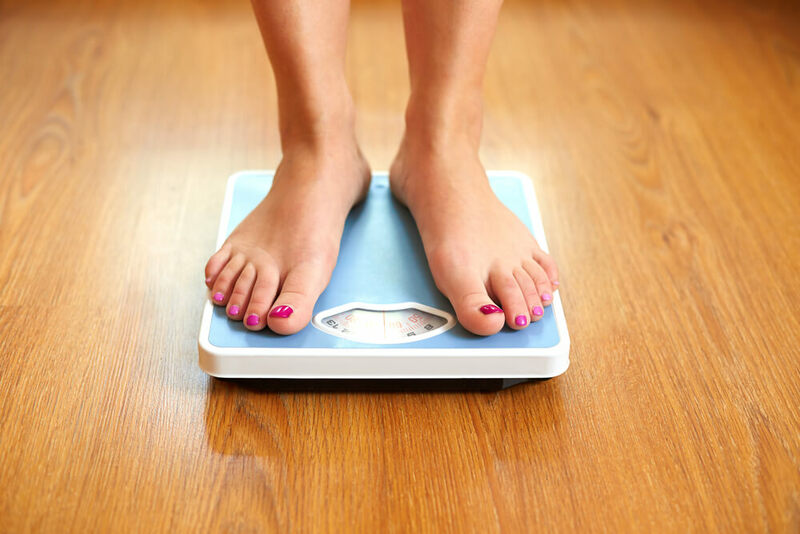 While dioxin is often found in very small quantities, all of those small quantities add up. 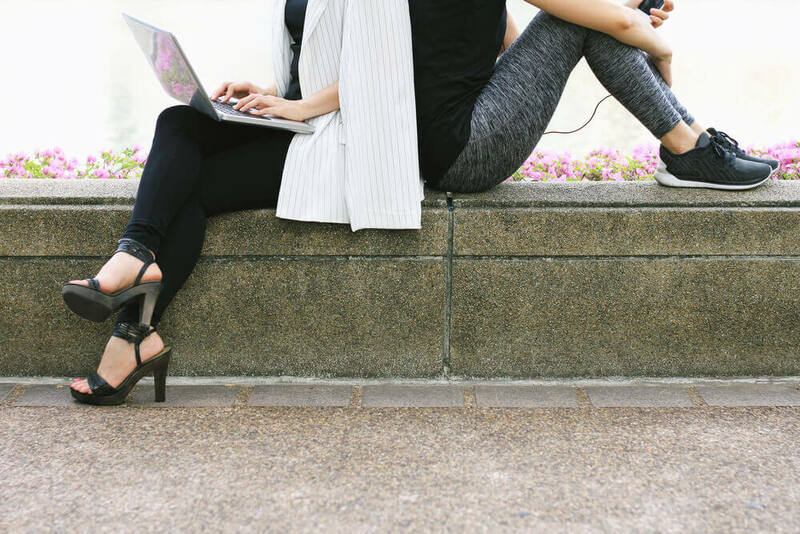 When you’re on your period, depending on your flow, you’re using anywhere from four to seven tampons each day, for five to seven days each month, for twelve months of the year. That adds up. I understand it can be a little confusing when we’re talking about chemicals like dioxin, because there’s a lot of conflicting information out there and it’s hard to know what to believe. But when it comes to the pesticides and genetically-modified organisms, there’s no doubt. Tampons and pads are made with cotton, a natural material that you’d think would be safe. But the reality is that cotton is exposed to pesticides (over $2 billion is spent annually on pesticides just for cotton crops!) and 94% of US cotton is genetically engineered (2). Aside from the health concerns, conventional period products are not great for the environment. For starters, the pesticides used to make period products can pollute our land, water, and air. Disposable products, like pads and tampons, create a lot of landfill waste and they don’t break down easily, so they contribute to the creation of greenhouse gases. They’re also usually wrapped in lots of plastic, which takes about four hundred and fifty years to decompose. That said, they’re not exactly something you can go without. Luckily, there are a lot of different natural period products out there! When think about going ‘green’, always consider two things – your health and the environment. I’ve been using the DivaCup for over six years, and I don’t think I’ll ever go back to pads and tampons. The DivaCup is a reusable, silicone cup that offers twelve hours of leak free protection. 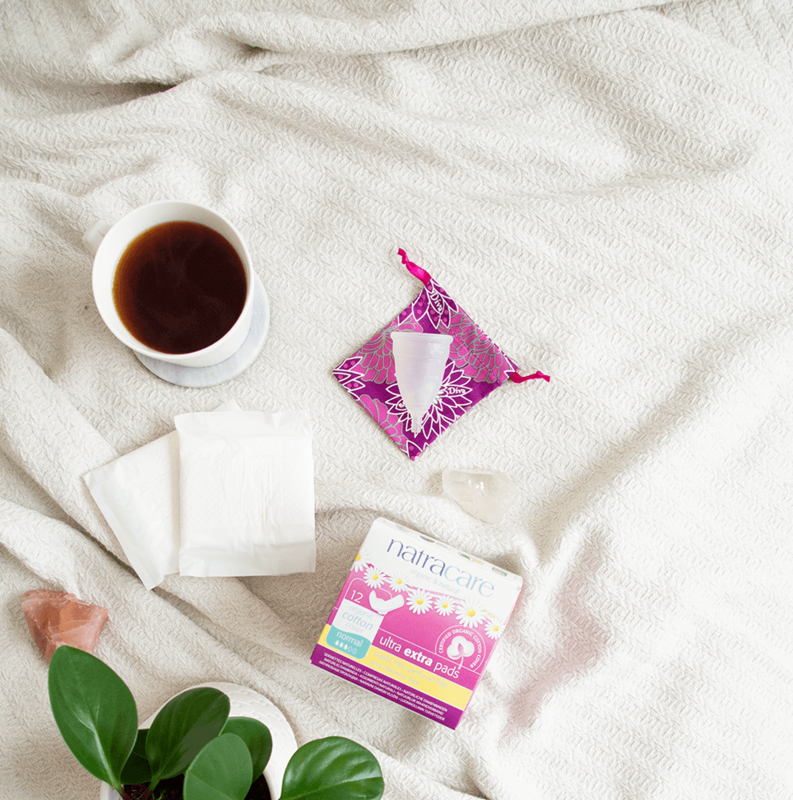 The leak free protection is a huge benefit – I always found tampons and pads to be a little unreliable, as your flow changes each month. 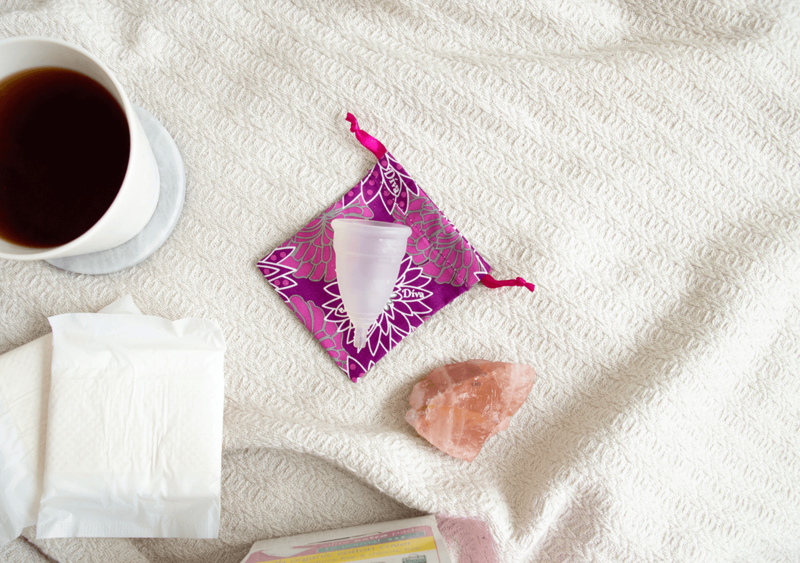 With the DivaCup, I don’t have leaks so that’s one less thing to worry about during my period! If you’ve never heard of a DivaCup, you probably have lots of questions. First things first – this is totally safe. The DivaCup is actually the only cup that’s considered a medical device which, for me, is reassuring. It might feel a little weird to insert at first but after your first cycle, you’ll be a total pro at it. When it comes to cleaning the DivaCup, there’s really nothing fancy to worry about. After emptying the cup, simply wash with soap and water (making sure to rinse really well!) and reinsert. You can also buy the DivaWash, which is specifically formulated for the DivaCup and to help maintain a healthy vaginal pH balance. Or, you can also boil (yes, boil!) the cup in between your cycles to sanitize it. If you have more questions, I highly recommend reading up on the DivaCup here, or feel free to ask questions below and I’ll do my best to answer them! No need to carry around extra pads and tampons! The DivaCup is a reusable, silicone cup that offers twelve hours of leak free protection. 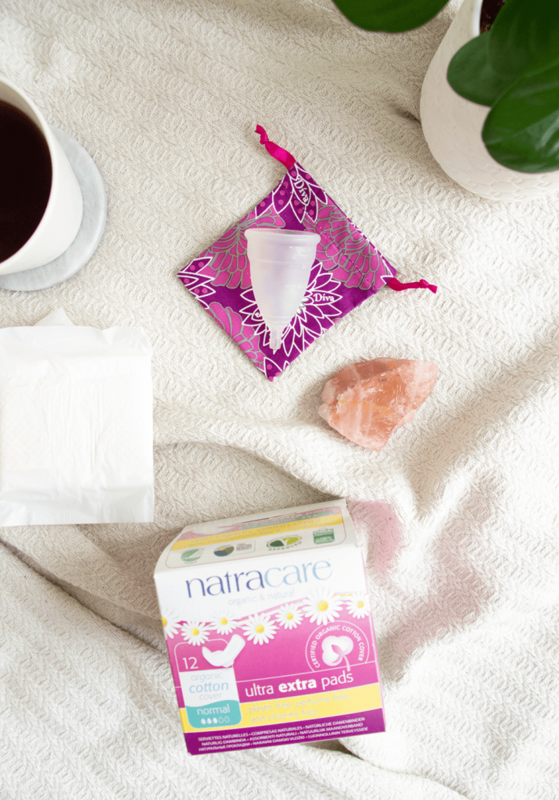 If a menstrual cup doesn’t sound like your thing but you want to try natural period products, organic pads and tampons may be for you! Made with organic cotton instead of conventional, these pads and tampons are more gentle on your body and on the planet. Organic pads and tampons are more gentle on your body and on the planet. If you’re not into the DivaCup but want to try another reusable period product, reusable pads may be an option! Brands like Fabulous Flo and Lunapads offer a range of reusable, organic cotton pads in different sizes and for different flows so you can find one that’s just right for you. Finding the right period product for you, your health, and the environment means considering all the facts but ultimately, it’s about making a decision that’s best for you! We’d love to hear about your favourite period products and what you like about them, so comment below! (1) CNN: What’s In Your Pad or Tampon?